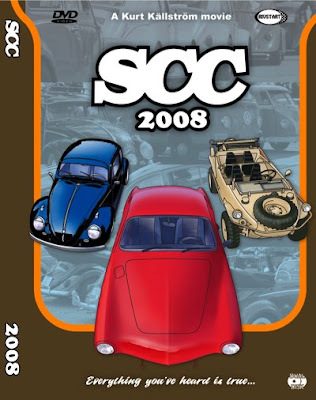 The Sechs volt Garage Blog: The DVD from SCC 2008 with a lot of Sechs volt-fun! The DVD from SCC 2008 with a lot of Sechs volt-fun! BASED ON A TRUE STORY: (all text and picture from SCC). The moment we´ve all been waiting for is here: The arrival of the SCC 2008 DVD!!! Kurt Källström and Rivstart Productions have made their best release yet with the 2-disc edition of Scandinavia´s coolest aircooled event! Everything´s there, the outstanding race action, the BBQ party, the vintage lounge, the show & shine, not to mention interviews with people from all over Europe capturing that very special SCC spirit!!! The first disc follows the SCC from the setup on friday morning with showcars, Kübelwagens and racers pouring though the gates and the Friday Night Screwdrivers T-BBQ in the evening, the racing action starting saturday morning lasting all day long until there´s time for... another party of course!!! All of it spiced up with lots and lots of interviews! The Bonus Disc contains a 30 minute "Vintage Special" with interviews with the owner and drivers of some of the rarest VW´s you will ever find in Europe! We´re talking Schwimmwagens, Barndoor buses, Hebmüllers and more! The best part? A total runtime of over 2,5 hours! No, scratch that - The BEST part is that you can buy it RIGHT HERE! SCC: YOU´RE IN THE MOVIES!